Today’s ride was to be a visit to Michael Jackson’s house in Holmby Hills, with a ride up and over Mulholland and home via the Valley. But it didn’t quite work out that way. We left Pasadena under overcast skies, but the forecast was for a chance of light rain later in the day. We rode down through Eagle Rock and across the river into Silver Lake. Then I got a flat. After fixing the flat, we continued on. 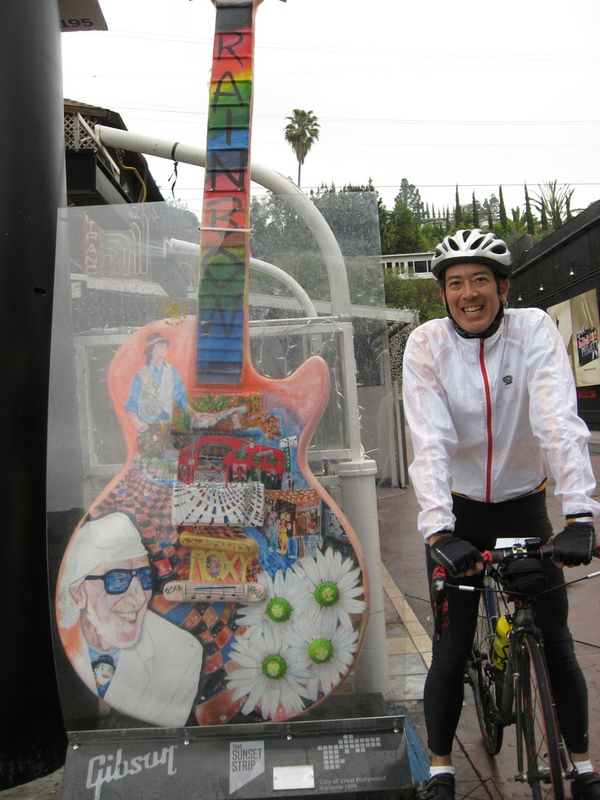 When we stopped for a photo-op with one of the big guitars on the Sunset Strip, we felt a few raindrops. We continued on, and it began to rain more. 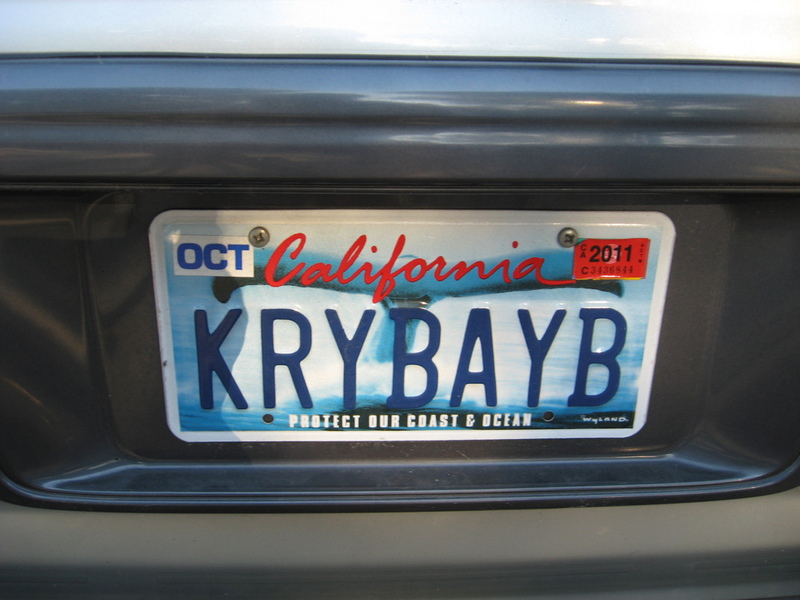 We stopped for a conference at the border of Beverly Hills. 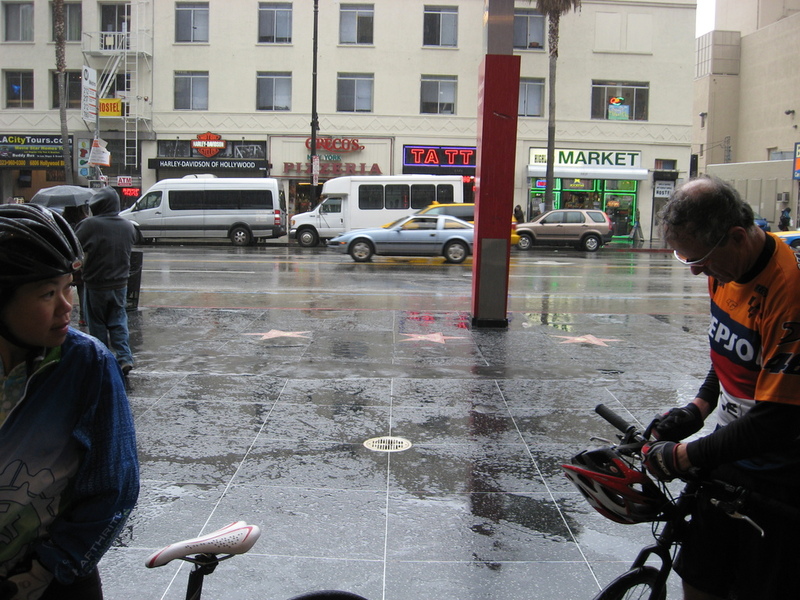 And then it started to rain in earnest. 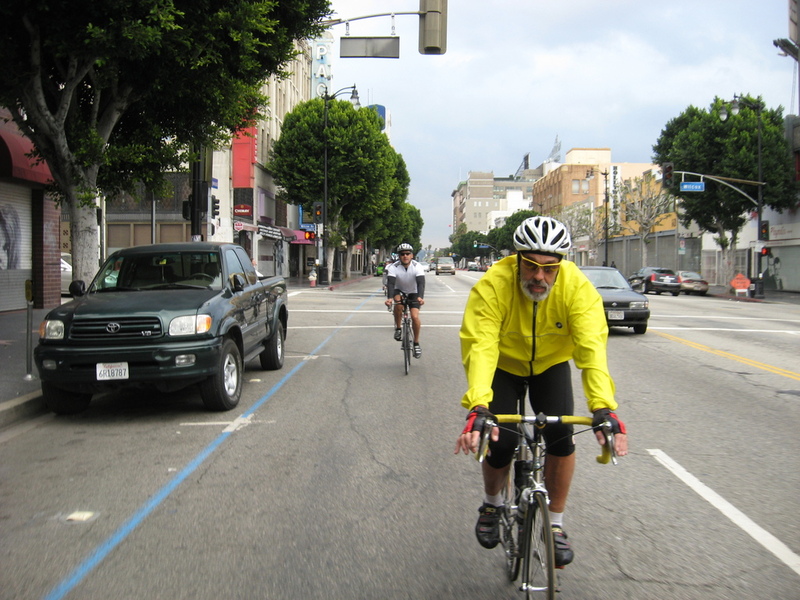 So we turned tail and rode back to Hollywood and Highland and the Metro Red Line subway station. 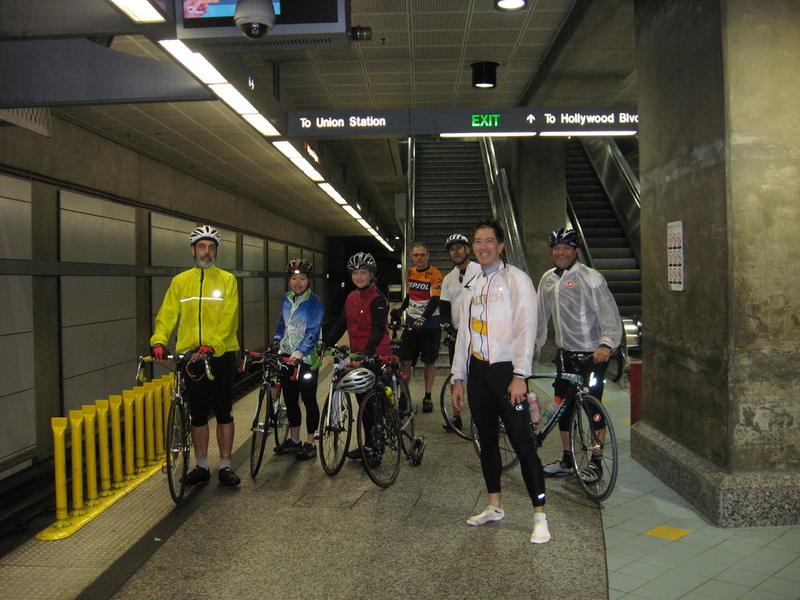 We rode the subway into downtown L.A. and then took the Gold Line train home to Pasadena. This marks the first time we’ve had to bail due to rain in the middle of a ride. 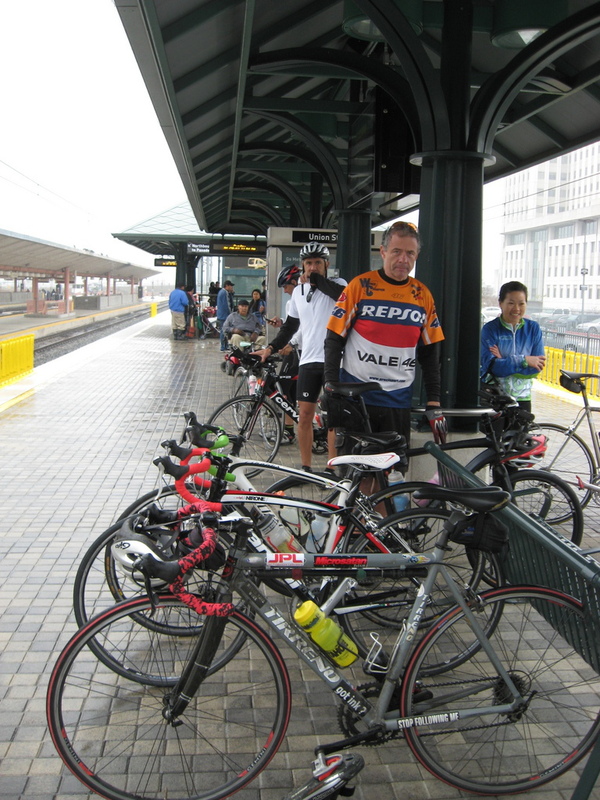 But we were fortunate that this happened on a ride where we were close to a subway stop. 26 miles and some wet riding. Over the weekend, I was looking at one of my old tattoo convention photo albums, and I realized that I’d met Michelle “Bombshell” McGee some years ago at the Inkslinger’s Ball. I spoke with her briefly and took her picture. She was quite pleasant. No hint of the notoriety she’d have 10 years later. 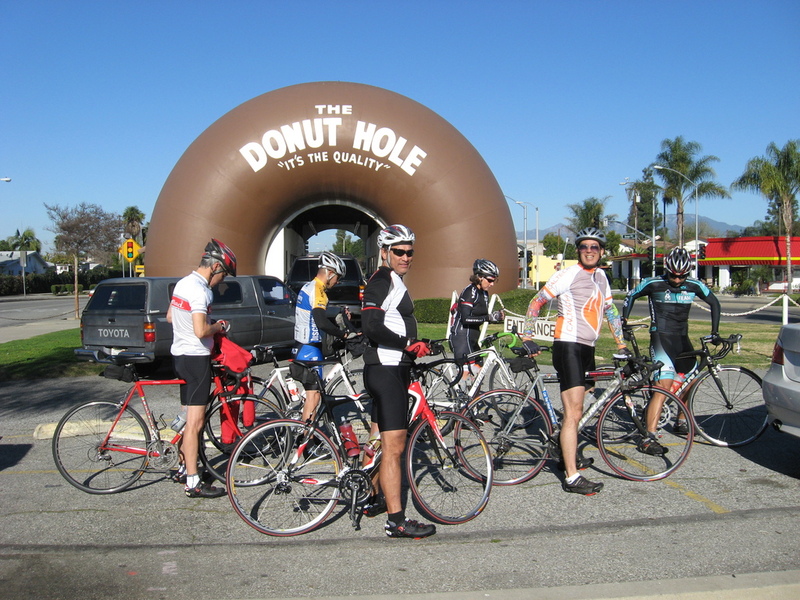 Today’s bike club ride was the “Big Donut” route to La Puente to see the Donut Hole. This is a drive-through donut shop with a giant donut on each end of the building. It was a nice day, and we had a good group for the ride. 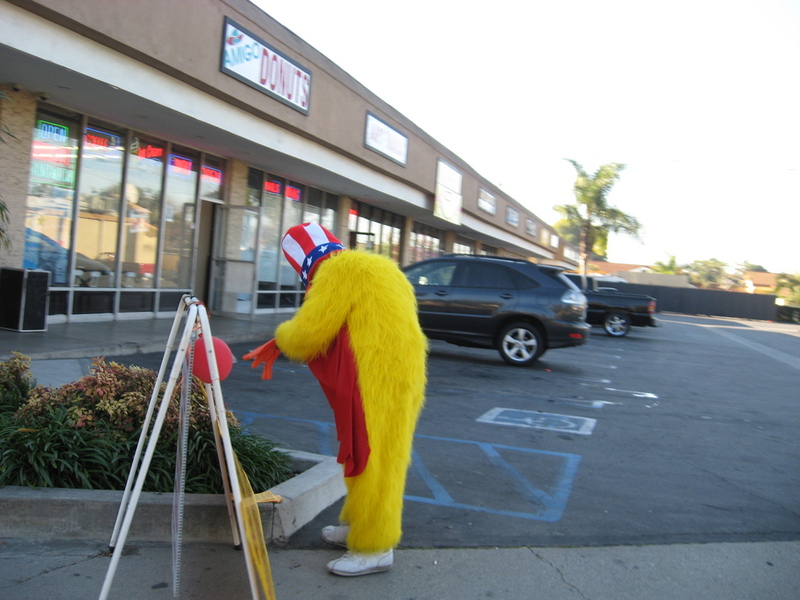 On the way down there, we passed a chicken restaurant and a man in a chicken suit getting ready for work. We also passed the headquarters of In-N-Out Burger, complete with In-N-Out University and the In-N-Out Company Store. At the giant donut, we paused for a photo. 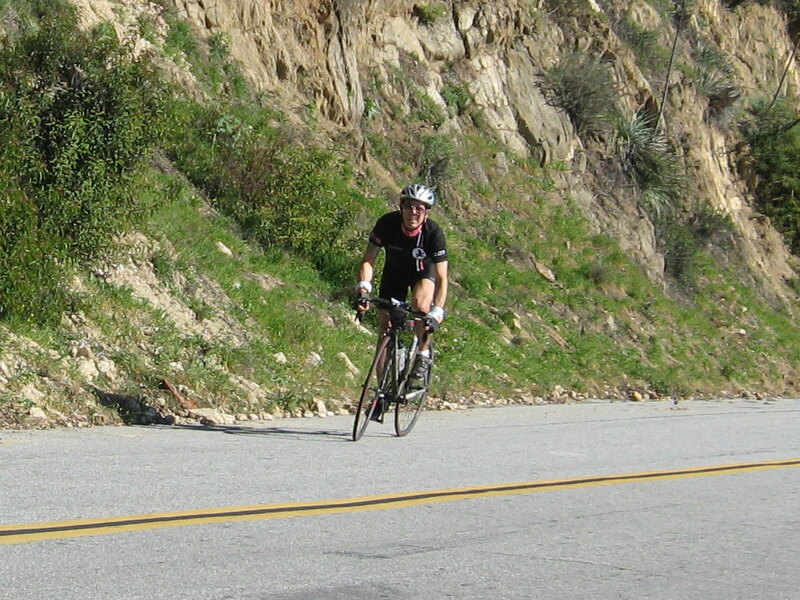 Then we rode on, heading back north, with the snow on the San Gabriel mountains as a backdrop. Our snack stop was at Merengue in Monrovia. Then we headed home across Sierra Madre. When we passed the Albertson’s, I veered off, because I saw the Oscar Mayer Wienermobile. 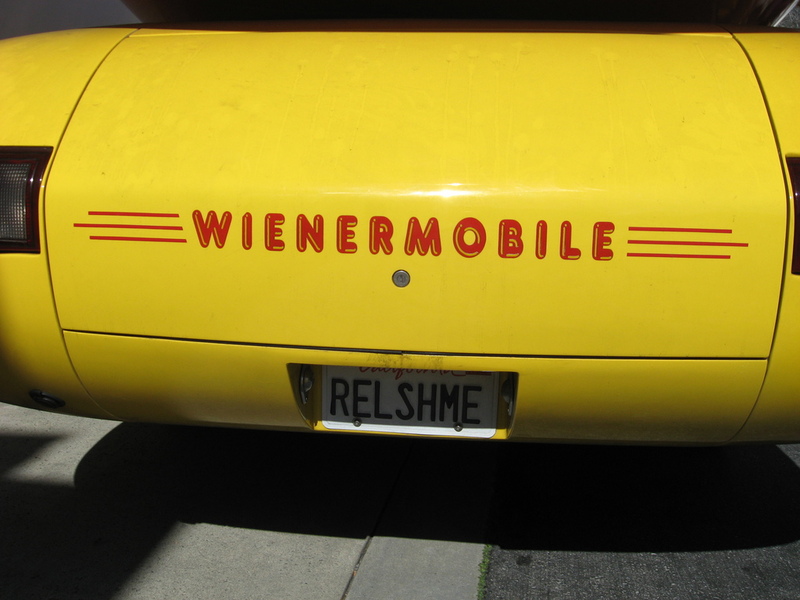 Like the big donut, the Wienermobile is a prime example of marketing with things shaped like the product being sold. And so I had to stop and see it close-up. 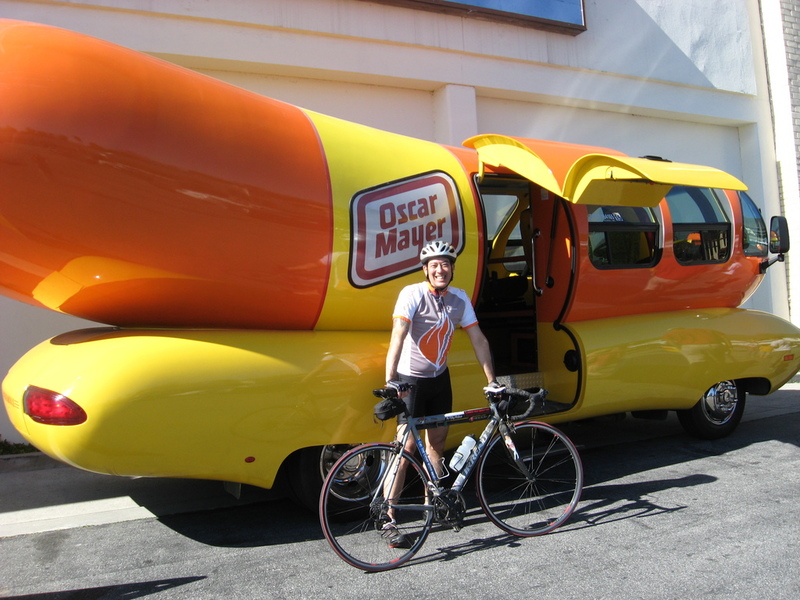 44 miles and one Wienermobile. Lucinda is now practicing for being a teenager. Which means she sleeps late on weekends. Since she was planning on sleeping until 11 or later today, I told her I was going to go for a ride in the morning. It was forecast to be a nice, warm day. 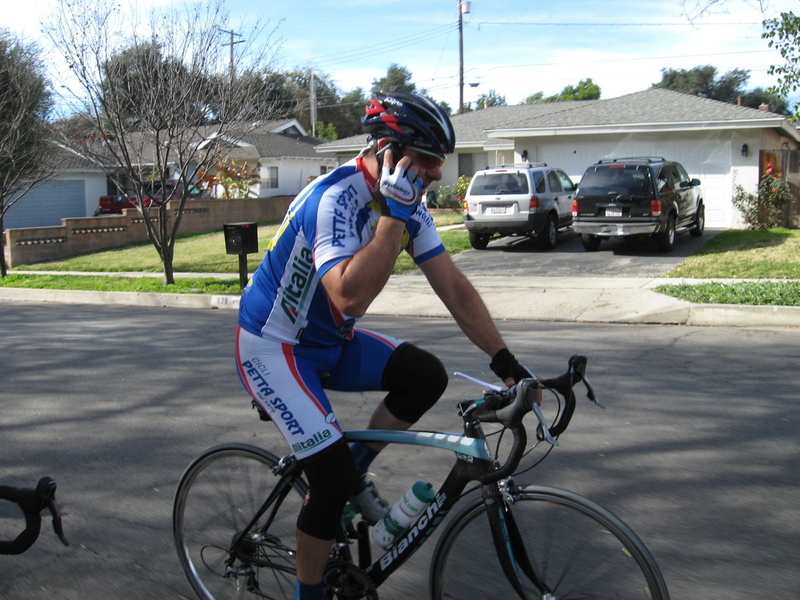 I rode down to Alhambra to meet up with the Foothill Cycle Saturday group for the first time in a long while. 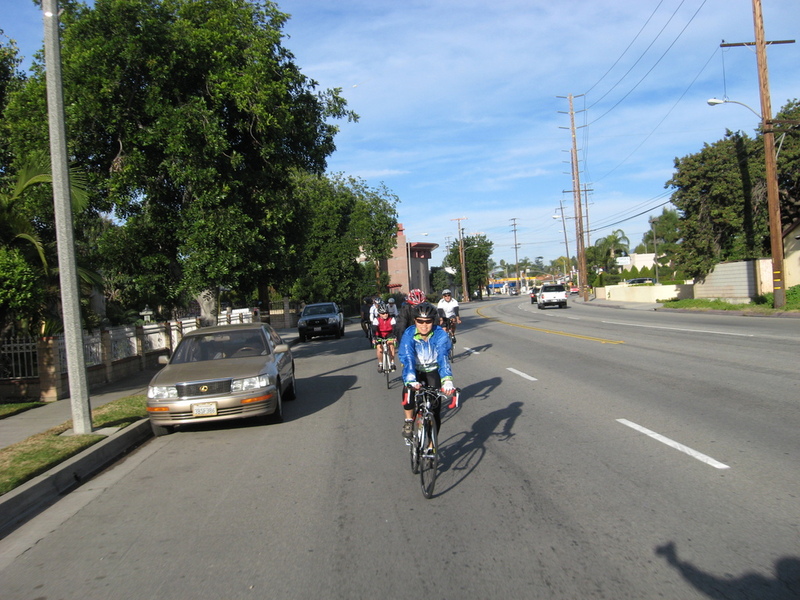 We rode up into South Pasadena and then over into Highland Park. 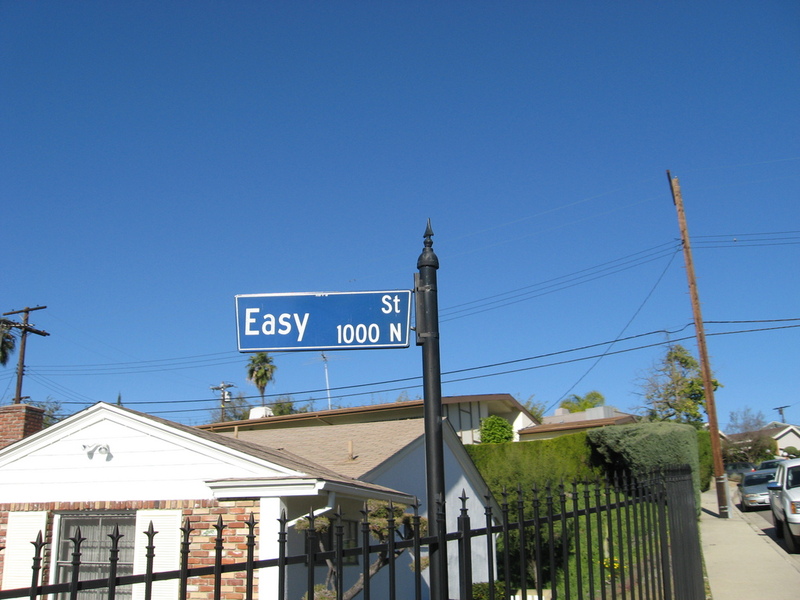 Up Easy St, and then into the San Rafael hills in Pasadena. 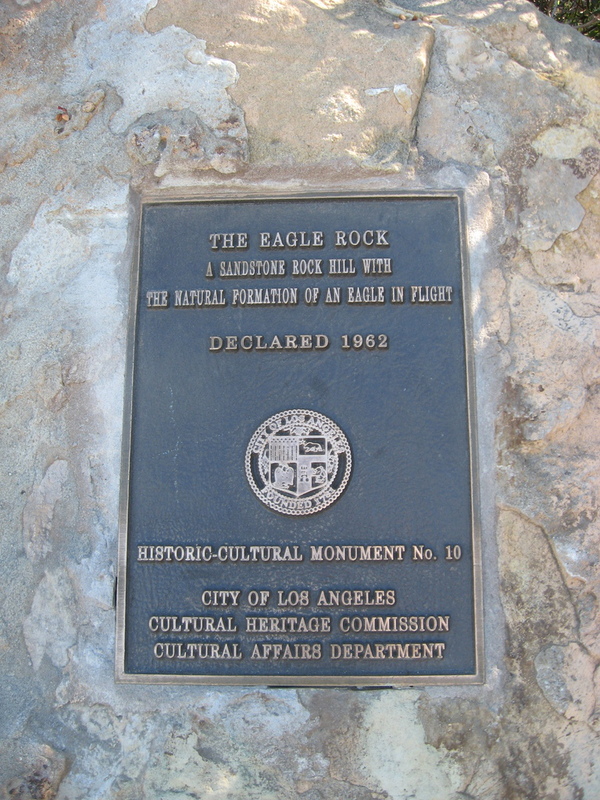 I took a little side trip down the street that goes to the base of Eagle Rock. I’d never seen the rock up close before, but from the vantage at the bottom, I could see the eagle in the overhanging cliff above. 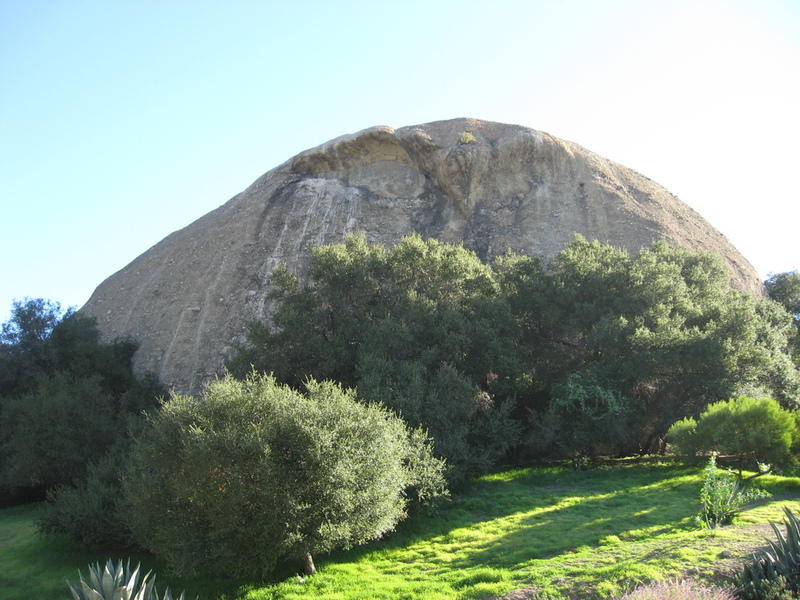 Then I continued on, up and over the hill and up the last big hill overlooking La Cañada. 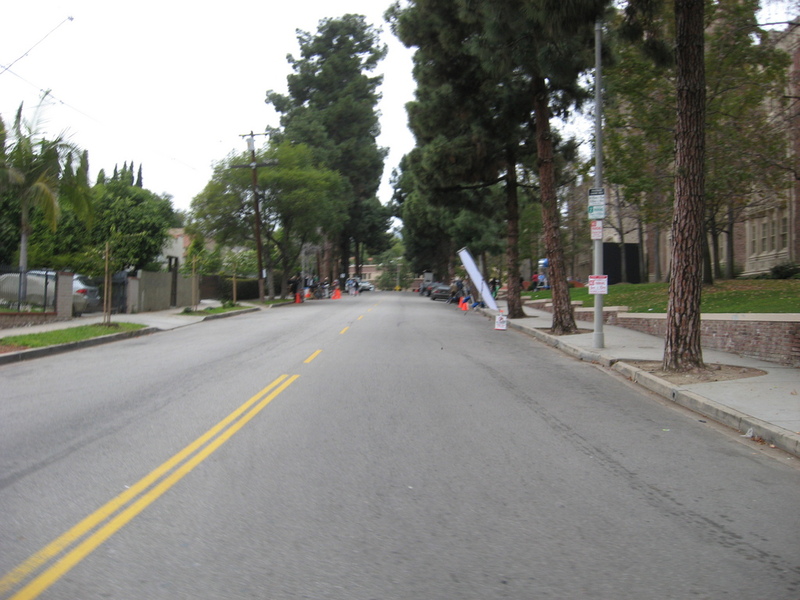 At that point, rather than going back to where we started in Alhambra, I took my usual route home across Altadena. It was a very nice ride. This afternoon, I got an email that there was going to be a launch of a Delta IV rocket from Vandenburg at 13:10:30 PST. I got this about five minutes before the fact, so I had just enough time to go across the street and up on the roof of the Seismo Lab. 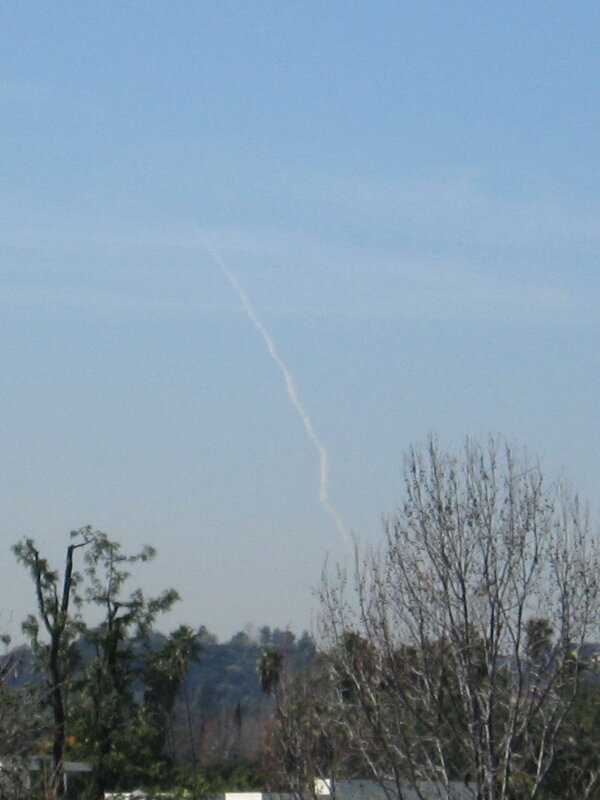 I wasn’t sure if it was going to be visible from Pasadena, since it’s quite far away, but it was. I could see the trail from the first stage very clearly. 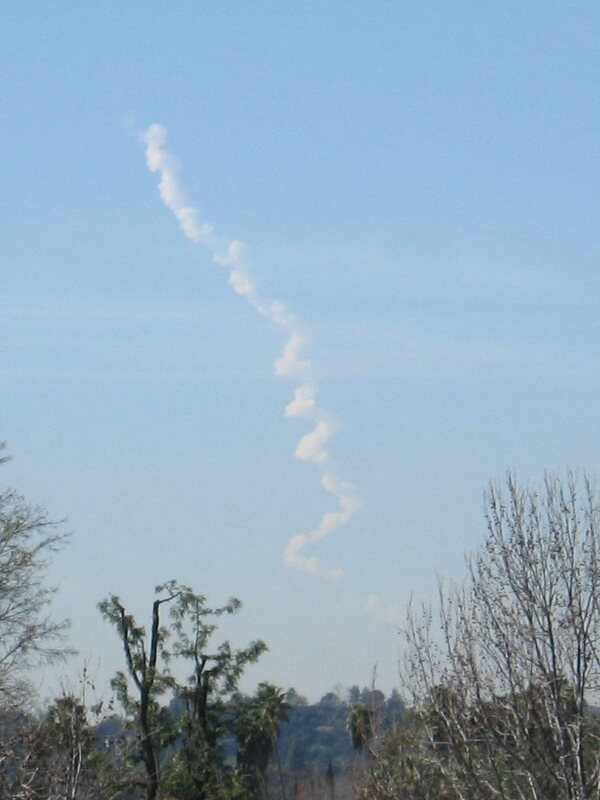 The first stage is powered by liquid hydrogen and liquid oxygen, so I guess the trail was just a very large vapor trail. It was impressive that it was visible this far away. Today’s bike club ride was the Topiary Tour Classic. This is a ride out to Glendora by a rather roundabout route that passes by every example of topiary to the east of Pasadena. It was a very nice day, and we had a good-sized group this time. 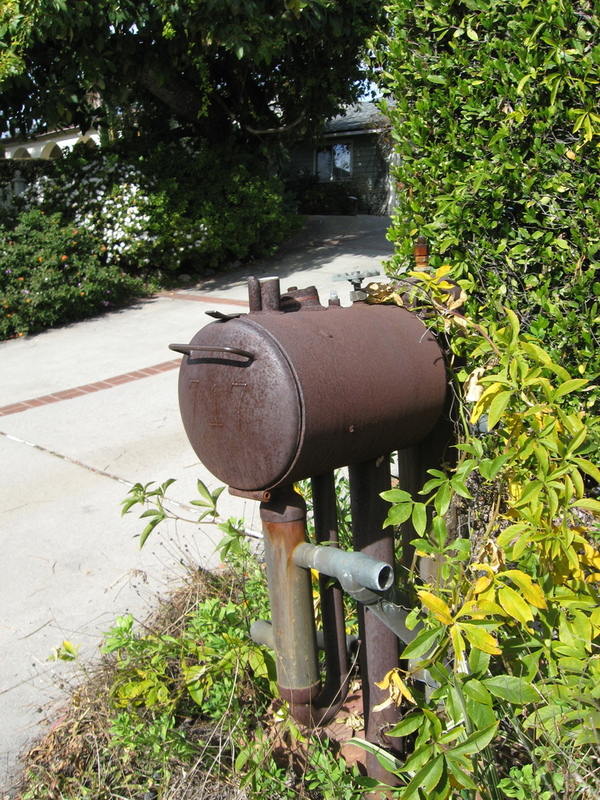 The first stop was the topiary Smokey the Bear by the fire station on Foothill Blvd in Pasadena. 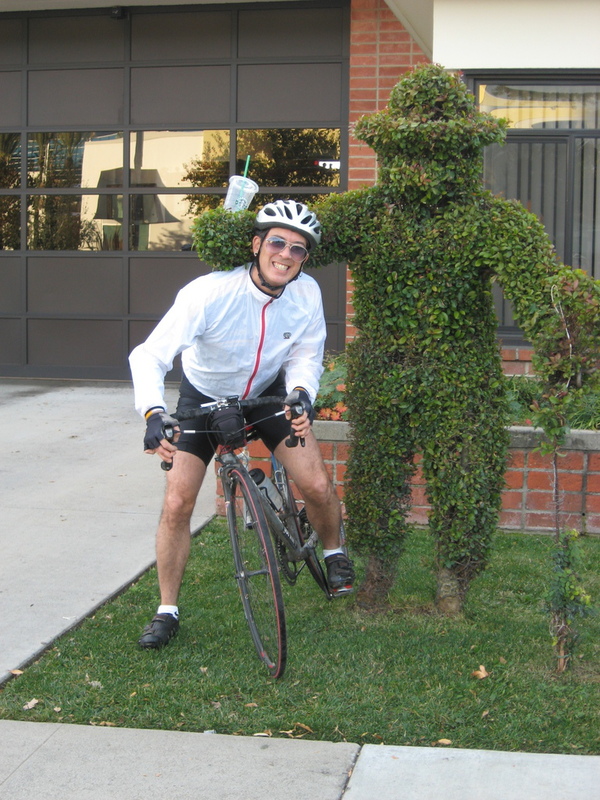 From there, we headed south and then east, passing by the topiary swan on Camino Real at Baldwin. 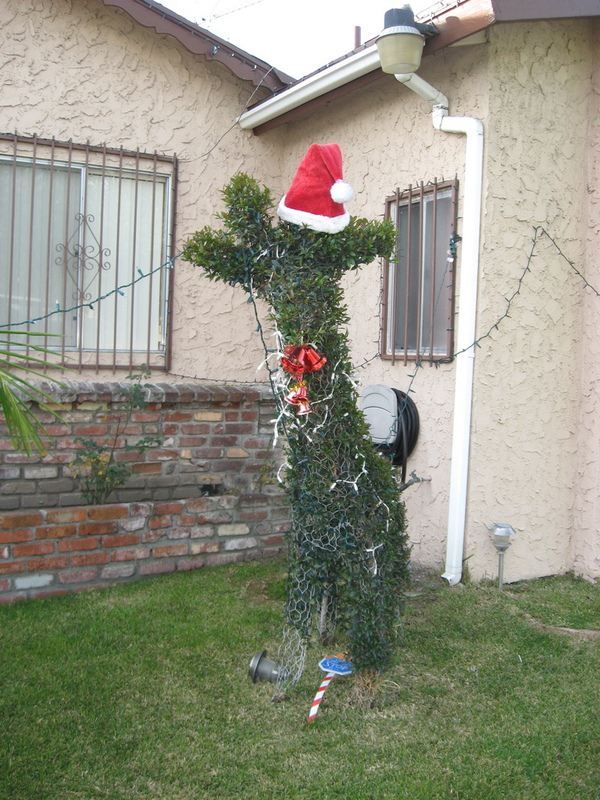 Then out into Baldwin Park to the house that has several topiary animals in the yard. 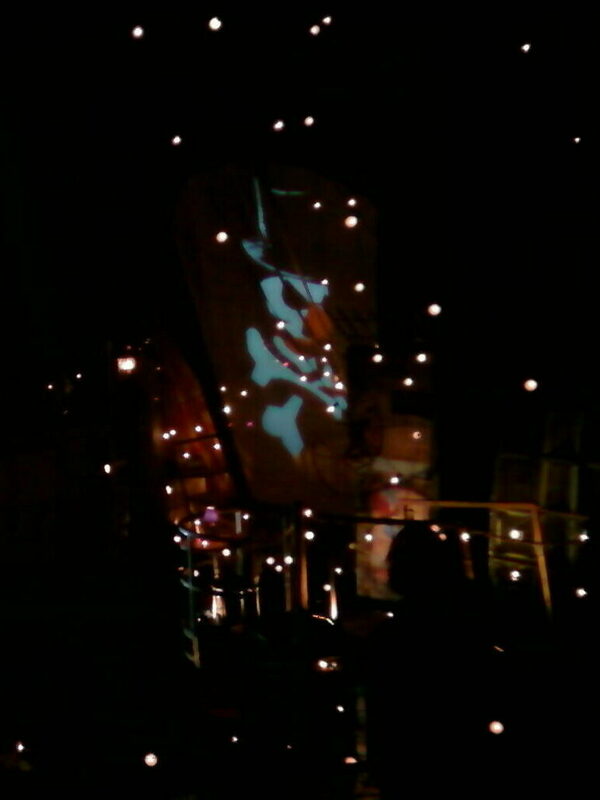 They had the giraffe done up with lights and a Santa hat. 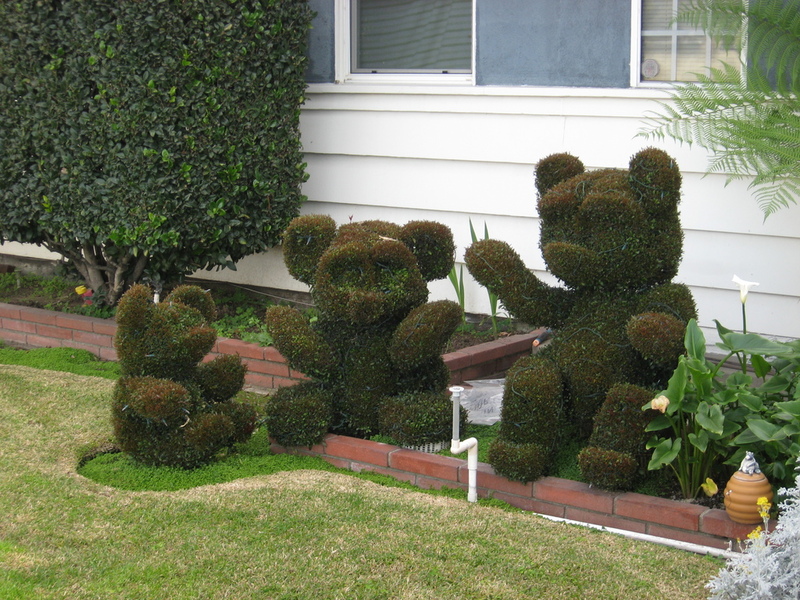 In Glendora, we passed by the topiary teddy bears. They were the first ones I saw, and they inspired this whole silly adventure. 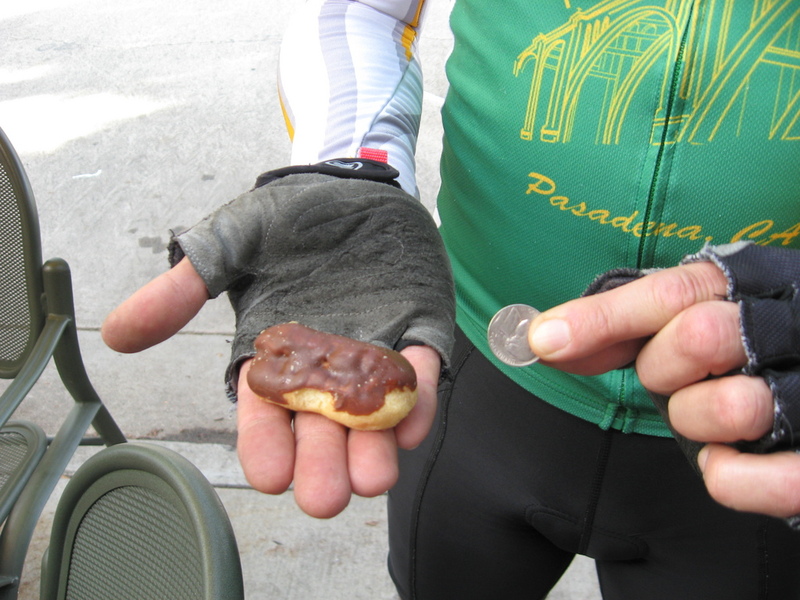 Then we stopped off at Classic Coffee in Glendora, where Carla got me the littlest eclair I’ve ever seen. It was good. 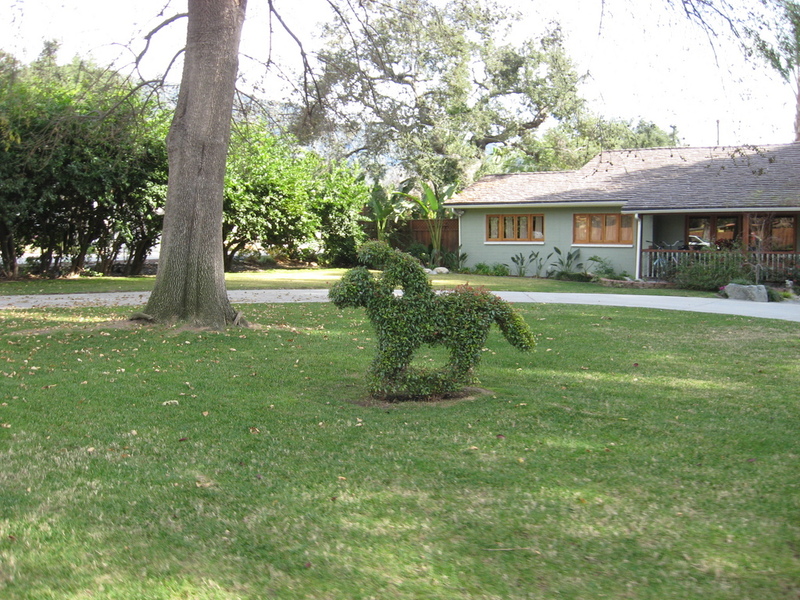 On the way back, we passed a few more small topiary animals in Glendora, and then a pair or horses in Monrovia. The last stop on the tour was the big rocking horse on Grand View Ave in Sierra Madre. We also saw what is likely the weirdest mailbox I’ve ever seen. Between that, the bass mailbox, and the catfish mailbox, maybe I can make up a weird-mailbox tour some day. It was a nice ride. I had an unexpected free afternoon on Saturday. And it was a very nice day. So I went for a ride. 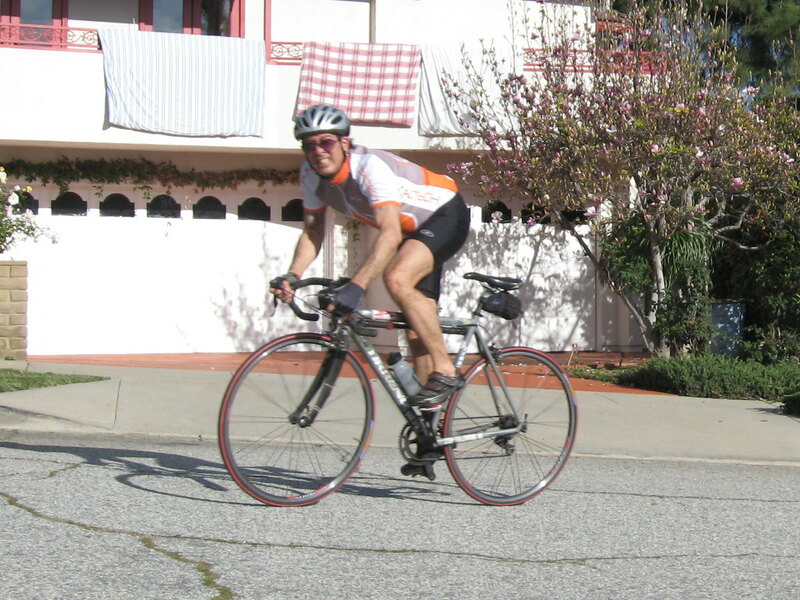 As always, when I’m out riding on a nice winter’s day in L.A., I remember when I used to ride in the winter back in New Jersey. This is just so much more pleasant. And I remember my 6th grade teacher, Mr Wagner. I did my usual route for when I have a free afternoon. Down to South Pasadena and up the hill to the water tower. Then back to the Rose Bowl for a few times around before going home through Altadena. It was a nice time. 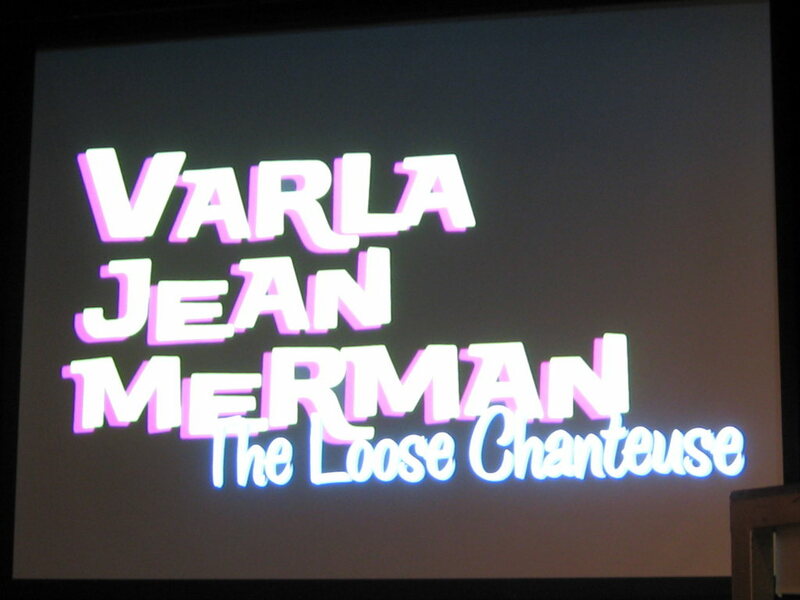 Tonight Kathleen and I went with my friend Nick to see Varla Jean Merman in her new show, “The Loose Chanteuse” at a little nightclub in Silver Lake. This was her first time back in Los Angeles since we went to see her “Varla Jean Merman Loves a Foreign Tongue” show back in 2008. One special bit of strange was that her show was sponsored by Fleet, and so, like Oprah, everyone there got a little box of Fleet enemas. And after the show, Varla held court at the top of the stairs, greeting fans and signing all the enema boxes. It was all very surreal, and weird in a very funny way. It was a very fun evening. 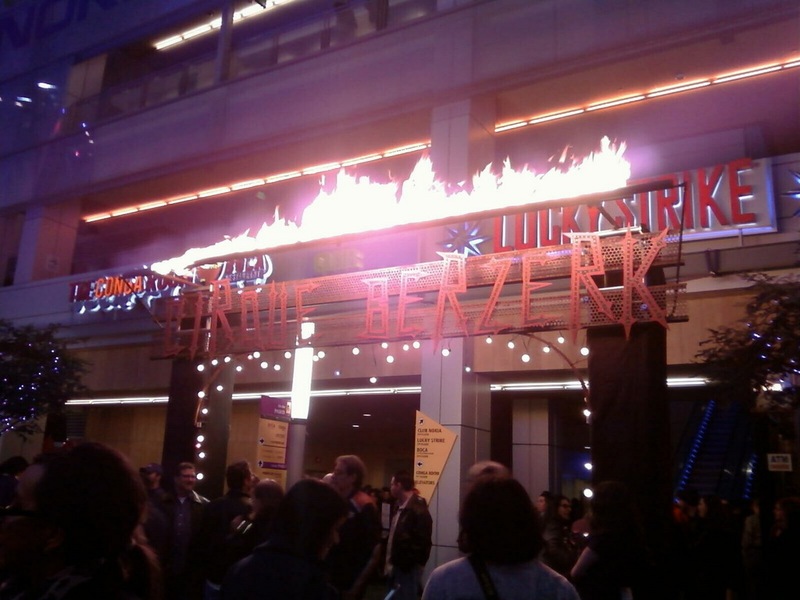 This evening, Kathleen, Lucinda and I went to see Cirque Berzerk again. I’d taken Lucinda to see them two summers ago. Apparently, they’ve moved uptown since then. The shows that time were in their tent, set up in the middle of a field outside downtown Los Angeles. This time, they were performing at Club Nokia at L.A. Live. The show was every bit as much fun as it was before. The story line was basically the same, but the acrobatics were a little different, but still very impressive. Kathleen remarked that it was much more theatrical than she’d expected. As I’d told her, their show sort of defies description. But it’s very, very fun. It was good fun and a weird evening in all the right ways. It’s now been three years since my whole divorce ordeal began. I’m finally feeling like the nightmare is over, and it shows. The top photo is from the first time I took Lucinda to Disneyland in January, 2008. At the time, I was definitely not the proverbial ‘Happy Camper’. 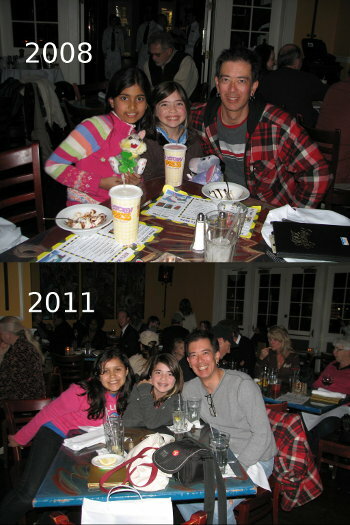 The bottom photo is from our trip to Disneyland yesterday.